Why "Running For Ryan"? Ryan Shay was my brother, with extraordinary ambition, and sadly, at 28, he passed away in the Men's Marathon Olympic Trials in Central Park on November 3, 2007. In his honor, I ran my first marathon on February 14, 2010 in Austin, TX. The money raised for this specific event was donated to the Wounded Warrior Project. Continuing with Running For Ryan, I am running the NYC Marathon on November 7, 2010, hoping to raise $26,200. Thanks for your support! I look forward to being back in San Antonio in 3 weeks for this special event! Can't wait for this event again! Last year it was amazing. It was POURING down rain the entire race, but it didn't dampen the spirits of the participants and volunteers. I was honored to volunteer and help direct race traffic when I bumped into Chris, a vet with a single leg amputation. He was 23 years young last year as he finished the race along with his mother, and we all crossed the finished line together, in what was victorious moment for both of them. "So I went over to the last water station and waited. The race had pretty much dissolved by this time. The weather, was for the most part, pretty nasty and it was impossible to stay dry anywhere. So, when this trio passed me by for the last time, I asked if I could finish the race with them. I didn’t know what to expect. I didn’t want to come across sympathetic, rather inspired. I introduced myself, and found out the trio was mom, Suzi, younger son in stroller, and grown son, Chris, who was injured in Afghanistan. Along the route, I stopped and gave Chris a hug. It’s my instinct, when I am standing next to a brave man or woman that has bravely served our country. Chris is 23, and may enroll at the University of Texas after he is discharged from the Army. His mother is still serving, as an active Texas Guard member of the U.S. Army. We chatted all the way to the finish, and as Chris and Suzi crossed the line, I could feel the pride of a mother toward her son, and I am pretty sure Chris was just as pleased to finish an 8k course, hiding any pain he may have been in from a drenched prosthetic attached to his right leg. However, the most inspiring thing for me on this day was not focusing on a soldier with an obvious injury, rather the guts and strength Chris has to continue to live a full life." If you are in Central Texas, please sign up to run this event, and help support our wounded veterans. It's a great time for all ages and speed. 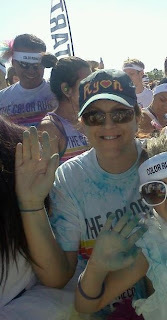 Well, wow, another great lapse in writing time, but had such a great time at the Color Run in Austin, TX last Saturday, May 4th.... it made me want to jot some thoughts down again. First off, I haven't really ran in a long time. I do go slow jogging about 3 to 4 times a week, but haven't participated in a road race in a long time...since the ING NYC Marathon in 2011! I say I was well overdue for some fun on the run! One of my girlfriends entered the event and I joined up last minute, wondering why the heck not? Well, this event was so CRAZY that it was a blast! I would recommend for anybody looking to enjoy the day, enjoy life, enjoy some exercise with family and/or friends. Strangely enough it was also on May 4th, the birthday of Ryan. So, I kind of have to contribute the date to making the running event that more special! It was a time to run and celebrate his life, and just get out and get comfortable in the little running circle again. It wasn't even a race...it was a run! It was a run for fun time! it will develop into something, but for a moment, I can say...there are still opportunites to have that spark again! Yesterday was the 5 year anniversary of my brother's death in the 2007 Men's Olympic Trials in NYC. As the anniversary approached, it's impossible not to think about him often, and the city of New York as well. We all miss my brother, and a time like this is very emotional for my parents and Alicia, who was Ryan's wife. As the 5 year mark came to me yesterday, I was filled with thoughts of love and thankfulness for all that I have in my life at this moment. "It is necessary to dig deep into ones self to find that hidden grain of steel called will". Such a powerful statement to think about, especially this year, in NYC and it's surrounding boroughs and neighboring states that were deeply affected by Hurricane Sandy. If you are human, you cannot feel anything but heartache for the families who lost loved ones, and for those who are now homeless and trying to cope and move on when winter weather approaches soon. This is why many were stunned the 2012 ING NYC Marathon would continue. Many are quick to jump on the bandwagon that Mary Wittenberg does not have a heart, and did not think about those suffering. I can tell you, Mary had a heart of gold when Ryan passed away. She did everything to make sure that I along with several other family members made it to NYC to help prepare the transfer of Ryan to Michigan where he was laid to rest. She cried, she encouraged, and she acted like a CEO should, and went straight into action to help us in our time of sorrow and need. I cannot say for certain why the marathon was scheduled, but for what the marathon represents, and how much it helps the runners and the city of NYC, it would be great to think first, that it was for good intentions. But it's all in the past now, and seeing today's headlines of 2012 NYC Marathon participants taking up new roles as volunteers in the area is what will become inspirational stories for them to tell back home. It will become more inspiring than a race time and more inspiring than a medal. When I was entered in the 2010 ING NYC Marathon, I trained forever, just like these runners did. 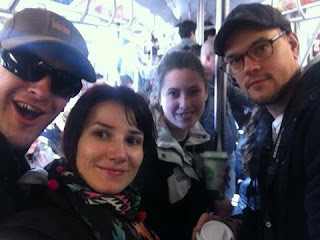 I made it to NYC, and I had an appendectomy on hour or so before the race began. My family had traveled from Chicago and Michigan to watch, and I felt heartbroken. I didn't want to finish the race for me, but for Ryan and for those who came to cheer for me. But instead when they came to visit at my bedside in the hospital, all that training and energy and money put into making it to NYC, was nothing compared to knowing I would be ok and I could deal with that. I had to stay an extra 3-4 days in NYC and Mary Wittenberg knew about this, and she helped out by giving my sister(who stayed on to help my recovery) and I accommodations for the time I needed my incision to heal. When I returned home to Austin, I sent my sincere thanks back to Mary and the NYRR staff because that was the second time they had been so helpful. Just when I thought, running would be over, I decided after a few months, I would use my deferment, and try for 2011 ING NYC Marathon. It was the hottest summer in Texas, and the drought had burned up thousands of homes in near by Bastrop, but somehow I got the miles in, and made it to NYC again. Once again, I didn't care about the time, I just wanted to finish for Ryan, and for my family who came again to cheer for me!!! I finished. Some of the NYRR staff knew I was running this time again, and sent me heartfelt encouraging emails or voice mails. Being a single parent, and already spending alot between hospital bills and training and traveling, Mary helped out once again and gave me a place to stay. When I completed the marathon, she sent me a handwritten card...I can't find it right now...because I recently moved....but it read something like" So glad you were able to honor Ryan and complete the marathon. I think about him everyday". Does this sound like a heartless CEO? No, this, to me, is a person who has a million and one things to juggle by putting on the largest marathon in the world, but still took the time to reach out to a slow, unknown runner, way over in Texas, to show support. Not only Mary, but the entire staff was on board to encourage me to finish for Ryan. 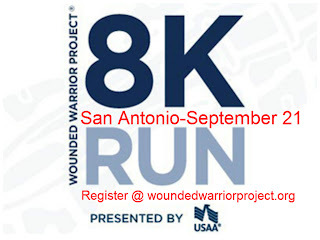 On a very rainy morning on Sunday, September 16th, 2012, I was honored to volunteer and be a part of the San Antonio Wounded Warrior Project 8K road race. From what I heard, the event has raised over $95,000 for WWP from participants in last Sunday’s race. It’s been almost a year from finishing the 2011 NYC Marathon, and life has continued to run in its usual face pace: A new job, a new place to live, and a continuing deep appreciation for what our troops and their families have sacrificed for us and our country. Over the past several months, there have been debates, speeches, and a no shortage of opinions on what we should be doing as a nation and who should be leading it. So, it was refreshing to break away from the in-your-face campaigning going on around the internet and television and focus, for a morning, on our troops and their families. On this particular morning, it was cool, slightly drizzly, but the atmosphere was full of excitement and joy. All the volunteers were pumped to take part in the event as much as the runners were enthusiastic to complete the nearly 5 mile run, in which would become a down pouring of rain for the entire duration of the race. But on this day, it wasn’t a race like most races. This race was full of love and contentment, just to show pride and support for our servicemen and women, especially those who have been injured since September 11, 2001. On this day, I volunteered to help direct the runners along the race course. By the time the runners passed my point on the course, I was drenched from head to toe, but it didn’t matter. The runners started passing by, soaking wet, but smiling and chugging along through the heavy rain and deep puddles of water. I had my camera on me, and started snapping shots of the participants, when one trio had caught my attention. It was a woman pushing a stroller, and a man walking the course with an amputated leg. They were several minutes behind the last of the pack, but trucking through the bad weather, and determined to complete the entire course. After the last of the race entrants had passed my point on the course, I jogged over to the 3 mile mark, not wanting to be done for the day. So, I took out my camera, and started snapping photos again. Here came the trio including the lady, child in stroller, and wounded veteran passing me by again. There was a look on this man’s face that made me want to stand through the rain and see him make it to the finish. So I went over to the last water station and waited. The race had pretty much dissolved by this time. The weather, was for the most part, pretty nasty and it was impossible to stay dry anywhere. So, when this trio passed me by for the last time, I asked if I could finish the race with them. I didn’t know what to expect. I didn’t want to come across sympathetic, rather inspired. I introduced myself, and found out the trio was mom, Suzi, younger son in stroller, and grown son, Chris, who was injured in Afghanistan. Along the route, I stopped and gave Chris a hug. It’s my instinct, when I am standing next to a brave man or woman that has bravely served our country. Chris is 23, and may enroll at the University of Texas after he is discharged from the Army. His mother is still serving, as an active Texas Guard member of the U.S. Army. We chatted all the way to the finish, and as Chris and Suzi crossed the line, I could feel the pride of a mother toward her son, and I am pretty sure Chris was just as pleased to finish an 8k course, hiding any pain he may have been in from a drenched prosthetic attached to his right leg. However, the most inspiring thing for me on this day was not focusing on a soldier with an obvious injury, rather the guts and strength Chris has to continue to live a full life. We plan to keep in touch, and I look forward to building a friendship, that might have never formed, had I not stuck around. The Wounded Warrior Project has given me some of my proudest moments in life, and I hope to jump on board to more events happening in Central Texas in the near future. Also proud to say, I wasn’t the only one from my work to participate. My boss, Tom was a volunteer, and Patrick, a co-worker from the San Antonio office, ran the race and raised funds for WWP. He has also served in the military. As I was driving back up to Austin, I was thinking how these types of events are great for any company to jump on board, from volunteering to fundraising. If we all did one or two events a year, it adds up to a lot of volunteer support, and a lot of donations. It's been awhile and hoping to reach a few readers. It's been awhile since I have posted on here, but it's been brought to my attention by the Wounded Warrior Project (WWP) that a parade will take place in Austin, TX on July 7th, 2012 at 9am at South Congress bridge for veterans, followed by a job fair by local companies looking to help veterans transition into civilian work force. Please come by and show your support for the parade if you are in the area on this Saturday. Also, if you are an employer, reach out to the committee from link below to see how you can help! Thanks so much! UPDATE: Parade was great! Wish more Austinites knew about it, but glad to meet up with some awesome veterans! Here I am below (head down of course...ha ha) with the group who helped with Wounded Warrior Project part in Austin Parade (mostly all veterans). Happy Two Thousand and Twelve! Let's see what the universe has in store for us in 2012! Hope everyone is well! Just to catch up, I finished the 2011 ING New York Marathon on November 6th. It was GREAT to go back and finish a goal set from the previous year. It was an amazing experience and brought on with the help of many people. I will forever be thankful. 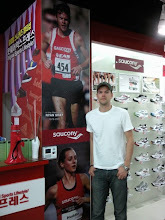 I am in the midst of trying to find new employment, so that keeps me busy these days, but hope to run a race again soon. There's a form to print out if you want to mail a check. The Wounded Warrior Project serves in various ways to give back to wounded veterans and their families . See link at bottom of page. The Wounded Warrior Project (WWP) is a registered 501c3 nonprofit organization with headquarters in Jacksonville, Florida. It began when several individuals took inspired actions to help veterans returning from Iraq and Afghanistan after being moved by the difficult stories of these warriors. The first WWP program started by leaving backpacks with essential small items at the bedsides of wounded soldiers, and has expanded with a range of programs to help heal veterans physically and emotionally. Some programs include health care advocacy (to include supporting those with traumatic brain injuries and amputees), counseling, coping services for family members, peer mentoring, transition training, and motivational activities like soldier ride (wwpsoldierride.blogspot.com). Donate with confidence, knowing that about 82 cents for each dollar given goes directly to the wounded veterans and their families as the WWP organization works hard to keep administrative costs low.